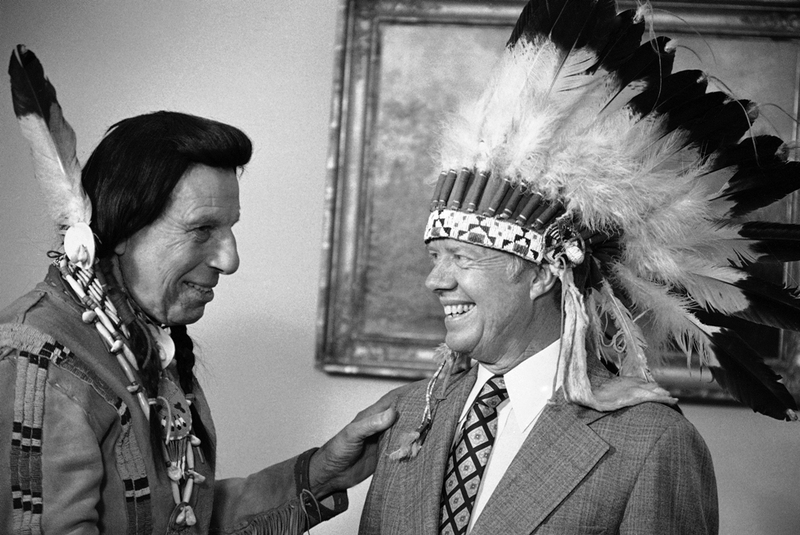 Iron Eyes Cody presents President Jimmy Carter with a Native American headdress in the Oval Office in Washington on April 21, 1978. Cody also gave Carter a Native American name, Wamblee Ska, which he said means “great white eagle.” Photo courtesy of Peter Bregg/Associated Press. It’s probably the most famous tear in American history: Iron Eyes Cody, an actor in Native American garb, paddles a birch bark canoe on water that seems, at first, tranquil and pristine, but that becomes increasingly polluted along his journey. He pulls his boat ashore and walks toward a bustling freeway. As the lone Indian ponders the polluted landscape, a passenger hurls a paper bag out a car window. The bag bursts on the ground, scattering fast-food wrappers all over the Indian’s beaded moccasins. In a stern voice, the narrator comments: “Some people have a deep, abiding respect for the natural beauty that was once this country. And some people don’t.” The camera zooms in on Iron Eyes Cody’s face to reveal a single tear falling, ever so slowly, down his cheek. Cody’s tear made its television debut in 1971 at the close of a public service advertisement for the anti-litter organization Keep America Beautiful. Appearing in languid motion on TV over and over again during the 1970s, the tear also circulated in other media, stilled on billboards and print ads, forever fixing the image of Iron Eyes Cody as the Crying Indian. The ad won many prizes and is still ranked as one of the best commercials of all time. By the mid-1970s, an Advertising Council official noted, “TV stations have continually asked for replacement films” of the commercial, “because they have literally worn out the originals from the constant showings.” For many Americans, the Crying Indian became the quintessential symbol of environmental idealism. But a closer examination of the ad reveals that neither the tear nor the sentiment was what it seemed to be. The campaign was based on many duplicities. The first of them was that Iron Eyes Cody was actually born Espera De Corti—an Italian-American who played Indian in both his life and on screen. The commercial’s impact hinged on the emotional authenticity of the Crying Indian’s tear. 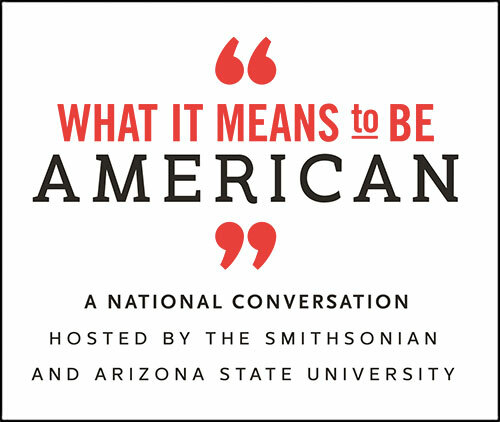 In promoting this symbol, Keep American Beautiful (KAB) was trying to piggyback on the counterculture’s embrace of Indian-ness as a more authentic identity than commercial culture. The second duplicity was that KAB was composed of leading beverage and packaging corporations. Not only were they the very essence of what the counterculture was against; they were also staunchly opposed to many environmental initiatives. KAB was founded in 1953 by the American Can Company and the Owens-Illinois Glass Company, who were later joined by the likes of Coca-Cola and the Dixie Cup Company. During the 1960s, KAB anti-litter campaigns featured Susan Spotless, a white girl who wore a spotless white dress and pointed her accusatory finger at pieces of trash heedlessly dropped by her parents. The campaign used the wagging finger of a child to condemn individuals for being bad parents, irresponsible citizens, and unpatriotic Americans. But by 1971, Susan Spotless no longer captured the zeitgeist of the burgeoning environmental movement and rising concerns about pollution. The shift from KAB’s bland admonishments about litter to the Crying Indian did not represent an embrace of ecological values but instead indicated industry’s fear of them. In the time leading up to the first Earth Day in 1970, environmental demonstrations across the United States focused on the issue of throwaway containers. All these protests held industry—not consumers—responsible for the proliferation of disposable items that depleted natural resources and created a solid waste crisis. Enter the Crying Indian, a new public relations effort that incorporated ecological values but deflected attention from beverage and packaging industry practices. KAB practiced a sly form of propaganda. Since the corporations behind the campaign never publicized their involvement, audiences assumed that KAB was a disinterested party. The Crying Indian provided the guilt-inducing tear KAB needed to propagandize without seeming propagandistic and countered the claims of a political movement without seeming political. At the moment the tear appears, the narrator, in a baritone voice, intones: “People start pollution. People can stop it.” By making individual viewers feel guilty and responsible for the polluted environment, the ad deflected the question of responsibility away from corporations and placed it entirely in the realm of individual action, concealing the role of industry in polluting the landscape. We can still see the impact of the Crying Indian campaign today in mainstream portrayals of environmentalism that prioritize the personal over the political. The answer to pollution, as KAB would have it, had nothing to do with power, politics, or production decisions; it was simply a matter of how individuals acted in their daily lives. Ever since the first Earth Day, the mainstream media have repeatedly turned big systemic problems into questions of individual responsibility. Too often, individual actions like recycling and green consumerism have provided Americans with a therapeutic dose of environmental hope that fails to address our underlying issues. 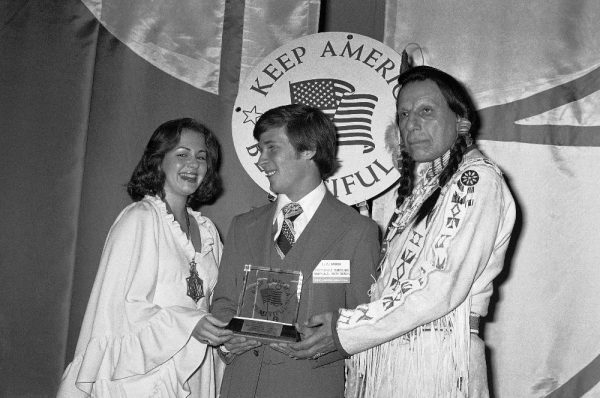 Iron Eyes Cody (right) at a Keep America Beautiful awards ceremony with Leland C. Barbeur, president of the Fayetteville, N.C., County Youth Council, and Miss Teenage America Cathy Durden, in Washington, D.C. on Dec. 5, 1975. Photo courtesy of Associated Press. But there is a final way that the commercial distorted reality. In the ad, the time-traveling Indian paddled his canoe out of the distant past, appearing as a visual relic of indigenous people who had supposedly vanished from the continent. He was presented as an anachronism who did not belong in the picture. One of the commercial’s striking ironies is that Iron Eyes Cody became the Crying Indian at the same moment that actual Indians occupied Alcatraz Island in San Francisco Bay, the very same body of water in which the actor paddled his canoe. For almost two years, from late 1969 through mid-1971, a period that overlapped with both the filming and release of the Crying Indian commercial, indigenous activists demanded that the U.S. government cede control of the abandoned island. They presented themselves not as past-tense Indians, but as coeval citizens laying claim to the land. The Alcatraz activists sought to challenge the legacies of colonialism and contest contemporary injustices—to address, in other words, the realities of native lives erased by the anachronistic Indians who typically populate Hollywood film. By contrast, the Crying Indian appears completely powerless. In the commercial, all he can do is lament the land his people lost. In recent years, the large-scale organizing and protests against the Keystone XL Pipeline, the Dakota Access Pipeline, and other fossil fuel development projects all represent a powerful rejection of the Crying Indian. While the Crying Indian appeared as a ghost from the past who erased the presence of actual Indians from the landscape, these activists have visibly proposed structural solutions for the environment while demanding indigenous land rights. Moving beyond individual-driven messages, they cast off static symbols of the past to envision a just and sustainable future. Finis Dunaway is Professor of History at Trent University. He is the author of Seeing Green: The Use and Abuse of American Environmental Images. Primary Editor: Lisa Margonelli. Secondary Editor: Sarah Rothbard.